Dr. Meagan Merinder was born in Sunnyvale, CA and lived there for 13 years before moving with her family across the country to Andover, MA in 1999. She completed her B.A. degree in Sociology and Pre-Med in 2008 at Holy Cross in Worcester, MA, where she also played four years of Division 1 women's volleyball. She attended veterinary school at Ross University School of Veterinary Medicine in 2010 and went on to complete her clinical year at University of Minnesota in 2014. 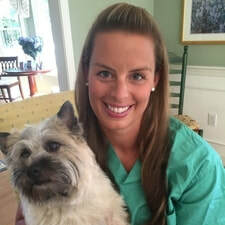 With a desire to return to her roots in the northeast, Dr. Merinder pursued a one-year internship in medicine and surgery at the Animal Medical Center in Manhattan and was happy to join City Veterinary Care upon completion. She has a passion for dentistry and has trained and worked alongside board certified veterinary dentists at the Animal Medical Center. She also attends the annual Veterinary Dental conference. She currently performs dental procedures at CVC including full mouth intra-oral digital radiography, comprehensive oral exams, and oral surgery including dental extractions and oral mass removals. She currently lives in Jersey City, NJ and has three cairn terriers named Bronson, Maddie, and Lexie.